They are also seven kings. Five have fallen, one is, the other has not yet come; but when he does come, he must remain for a while. 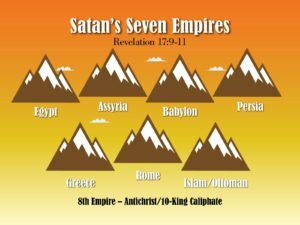 The above scripture indicates that Satan plans to take down Israel by raising up seven pagan empires to do his evil work. Since the time Egypt held Israel captive up until the Second Coming, there will be anunbroken chain of Anti-Semitic empires to do Satan’s bidding. The book of Daniel mentions four of these empires – Babylon, Medo-Persia, Greece and Islam. 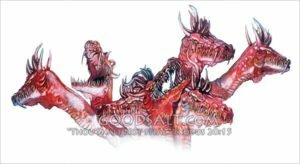 the seven dragon heads of Satan. Satan is symbolically portrayed in Revelation 12 as a great red dragon. From Revelation, we have to backtrack to identify who each of the empires are. factor of all seven empires is their opposition to Israel. They are unrelenting in their quest to assault and destroy the chosen people. Each time they try, God intervenes and supernaturally snatches them from the mouth of the dragon! Combined together, these empires have fought to destroy Israel for 4000 years. They have relentlessly sought to capture and control the promised land, the holy city Jerusalem and Israel’s holy temple. The coming empire will be no different as they seek the blood of the saints and Israel during the 7-year Tribulation. As predicted in Daniel and Revelation, Islam is rising up again today. Throughout most major cities and countries, around the globe, Islam is making its presence known. The force of Satan’s power is blowing Islam’s sails to the forefront in our generation as he reconstructs his final empire. At least six times, the future empire is referred to as one that previously existed (Rev. 13:3, 12, 14). It is also referred to as the beast (Rev. 13:1-8), the 8th empire (Rev. 17:11) the empire of Antichrist and the beast coming up from the abyss (Rev. 11:7; 17:8). Today, the Islamic Caliphate’s head wound is healing as Turkey, the former head of the Ottoman Empire, Islam’s last Caliphate, makes it’s comeback for the first time since being beheaded and dismantled by the Western Allies in WWI. The dragon gave the beast his power and his throne and great authority. 3 One of the heads of the beast seemed to have had a fatal wound, but the fatal wound had been healed. The whole world was filled with wonder and followed the beast. 4 People worshiped the dragon because he had given authority to the beast, and they also worshiped the beast and asked, “Who is like the beast? Who can wage war against it?